If you are a mathematician, physicist, engineer, computer scientist or economist, chances are high that your papers will be interspersed with equations. Equations make papers hard to read as they interrupt the flow of text, yet they have an essential function in any numerical research and with proofs. Use commas and full stops to separate equations from the following sentences or side sentences. 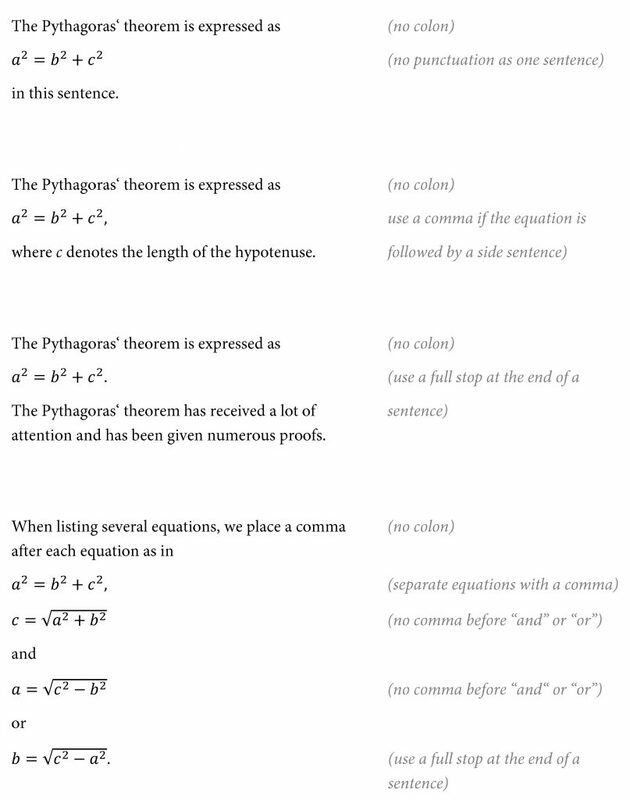 With the second style, one typically omits colons in the sentence preceding the equation, but uses punctuation after the equation: if the sentence following the equation is a full sentence, one would place a full stop after the equation; if the next sentence is a side sentence or starts with “where …”, one would place a comma after the equation. (The text in these examples is partly based on the related Wikipedia article).